After 5 long months of anticipation, my new Smoothline hardtop arrived this week. I was looking for a top which had a bit more room in it behind the seats so that one could fit a rollbar with rearward bracing under it. I think this will fit the bill. The top itself is very nicely put together and looks nice. I asked them to build it lighter than usual and it is maybe 15 pounds. The only downside is that the fitment is quite gappy - in the rain, water WILL come into the cabin. 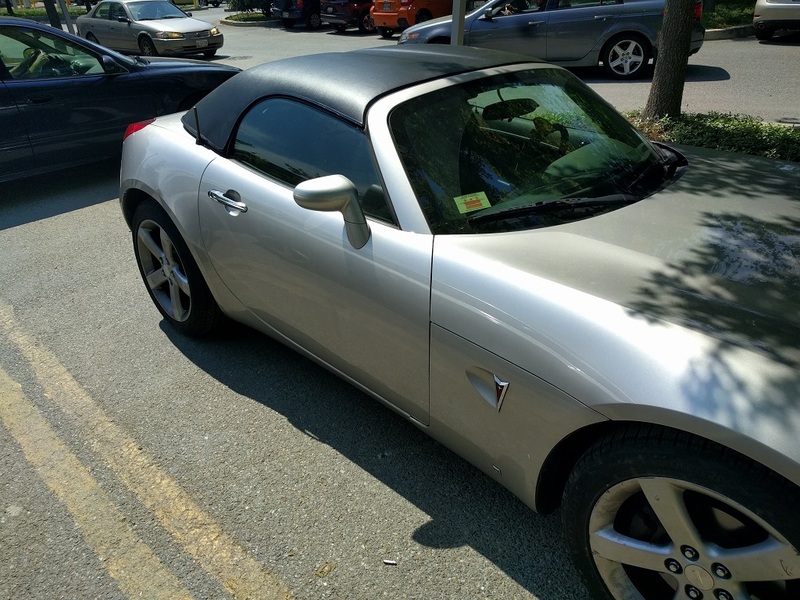 Since this is a track car, I'm not too worried about it, but I would be aware of this if you are looking to have a hardtop permanently replace your soft top. You could be in the odd position of having to remove the hardtop to drive in the rain! Looks great. Is that the Haartz Vinyl one? I had one that I loved on the roadster. When I added the Coupe to the family I decided to sell it to a Forum member. I am surprised to hear about the leaks. I had no issue with mine. The only thing I was careful about was when I washed the Sol I would not spray directly on the back window so water would not pool on the trunk lid. I drove through some major rain storms and had no leaks. When my top was ready I drove down to the factory to pick it up ( Haartz Vinyl so she was ready to go). They did the weather strip fitting and adjustments there on my Sol so maybe that is why she fit so well. Anyway, enjoy and looks great. These are NEW tops? Thought that they had stopped making these years ago. AFAIK they are still making them, when they have an order, and paid up front before shipping. I don't think they have ever had them "in stock". Each one is custom made. But what do I know. Does anyone have different opinion/facts? Last edited by DaveOC; 05-14-2018 at 07:03 AM. AFAIK they are still making them, when they have an order, and paid up front before shipping. I don't think the have ever had then "in stock". Each one is custom made. You are correct. Usually takes 6 months to get one. Did you put the seals on? I sure did! The only issue was that I got two driver's side seals, not one driver and one passenger, so the front of the passenger seal has a big ol' gap. I just stuck 'em on, because as I said I don't care one bit about having a sealed cabin. The track is windows-open after all! I am guessing if I had the car at the factory they could get it to fit perfectly. Mine leaks, but I don't drive the car in the winter or when it rains. I also have wind noise around the windows which could be alleviated if I adjusted the side windows to fit the hardtop better, but then you'd have to readjust them when going back to the convertible top. No thanks. When washing I'll spray the top, but avoid the windows and seals, including the rear hump area but water still manages to gets under the rear seal. I think the top itself is made well, so it may be more about taking the time to adjust it correctly. Though the front and rear turnbolts are twisted about as tight as I can turn them. I also condition the seals when the top is removed which I do about one a year to check on the trunk area. Otherwise the top is on all the time because I like the look of it, and fell in love with the 2006 SEMA Weekend Racer concept. I just got back from the rollcage fabricators, and the hardtop is going to fit perfectly, and permanently, because they are going to weld it to the A pillar and bolt the rear to the rollbar! Did you mean to post those (I assume) low-mileage Sols in this Smoothline top thread? For that five month wait did Jack (the supposed owner of Smoothline) keep telling you three more weeks three more weeks? What did you have to wind up saying to get him to understand he needed to get the top to you?! He's now told me it will "ship Nov. 30th" but refuses to put that into email because he says that "customer service costs extra." I kid you not. His words! You need to have a hard top in order to track you Solstice? Or so you can have rear bars on the rollbar?